Out of all the things I missed while I was in India – hot showers, blankets (it’s too hot to sleep with any but I missed the cuddle factor), and my kitchen, cookies were at the top of the list. Always. If you’re not allergic to gluten, you can find countless biscuits and cookie-like treats in India. Even the smallest of villages that I visited had a bakery that displayed a floor to ceiling wall of cookies. I was amazed to see just how many choices there were. Chocolate filled, cinnamon flavored, small cookies, large cookies, flat cookies, bulky cookies. You name it, they had it. But everything contained wheat flour! Out of all of the food I brought along with me, Eco-Planet gluten-free maple + brown sugar oatmeal packets, 8oz. packs of Manitoba Harvest hemp seeds and Artisana coconut oil travel packets were my saving grace. 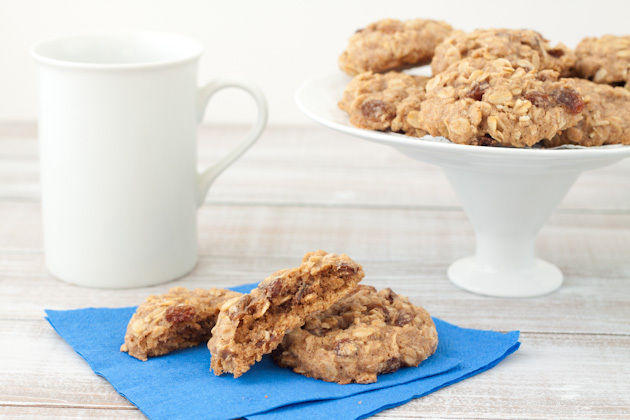 I couldn’t have cookies, but I could make my oatmeal taste like a cookie! 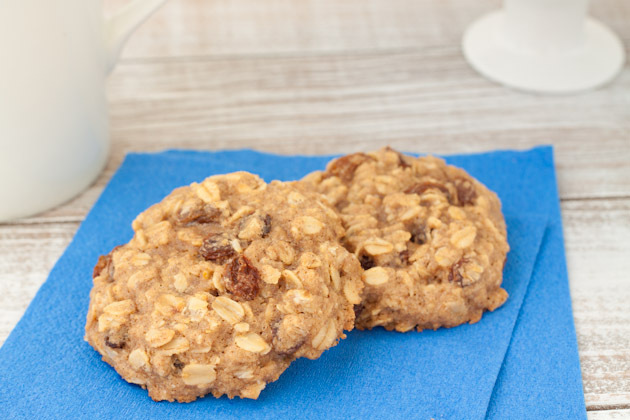 Many of my mornings started off with an oatmeal raisin cookie inspired oatmeal of hemp seeds, banana, coconut oil, Holy Crap cereal, leftover rice, cold water, pecans, walnuts, raisins, dates, and sometimes an apple on the side. It wasn’t an actual cookie, but it was pretty close and I really began to enjoy beginning my day with a rib-sticking breakfast instead of my usual fruit smoothie. 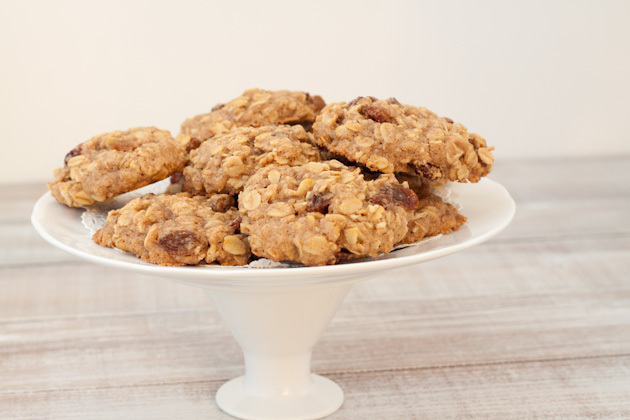 Given my India oatmeal experience, it should come as no surprise that the first recipe to come out of my kitchen on Friday night, before my bags were unpacked and stories had been shared, were oatmeal raisin cookies. And for Saturday morning breakfast? Oh, you guessed it. Hey, there are worse things. 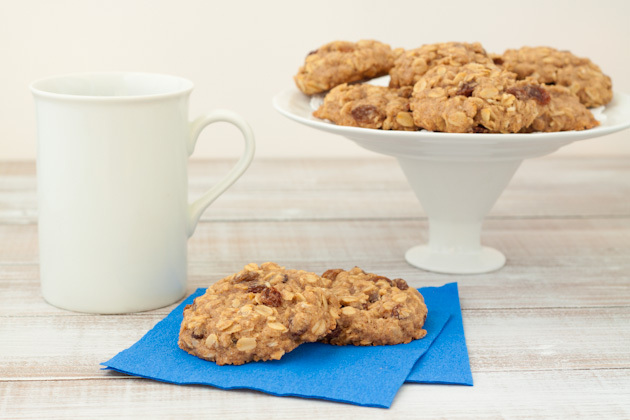 The gluten-free oatmeal raisin cookie recipe that was dreamed up in India and perfected for over 3 weeks before finally being created on Canadian soil! I know, it sounds epic. In a small bowl add the raisins and cover with water. Let them sit for five minutes before draining and setting aside. In a large bowl, cream together the butter, brown sugar, egg and vanilla until smooth and creamy. In a separate small bowl, whisk together the flours, baking powder, cinnamon, nutmeg, and salt. Add the dry ingredients to the butter and sugar mixture. Blend until combined then stir in the oats and raisins. 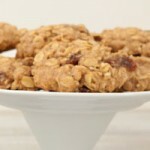 Spoon approximately one tablespoon of dough onto the prepared baking sheet, leaving a 1-inch space between each cookie. Bake for 10 to 12 minutes or until golden at the edges. Once removed from the oven allow to sit on the hot baking sheet for five minutes before transferring to cooling rack.